The story behind 19-year-old rapper Lil Nas X's "Old Town Road (Horses in the Back)" begins in late 2018 when the song, which blends rap and country elements (it's been called trap-country), gained massive popularity on the social media app Tik Tok. The song went viral, racking up 23 million views on YouTube. Then the song started gaining traction on the country charts. But in March, Billboard removed the song for its Hot Country Songs chart. In a statement to Rolling Stone, the publication defended its decision: "While 'Old Town Road' incorporates references to country and cowboy imagery, it does not embrace enough elements of today's country music to chart in its current version," the statement read. Billboard's decision sparked a conversation about race in the genre and what songs qualify as country music. Country music has long employed pop and rock elements and songs like Jason Aldean's "Dirt Road Anthem," which hit No. 1 on the Hot Country Songs chart, mix hip-hop and country. And one could argue that "Old Town Road" contains more country elements than Florida Georgia Line and Bebe Rexha's multi-week No. 1 EDM-inspired country radio smash "Meant to Be." So why was Lil Nas X's country-rap ode to the cowboy lifestyle removed from the Billboard country charts? 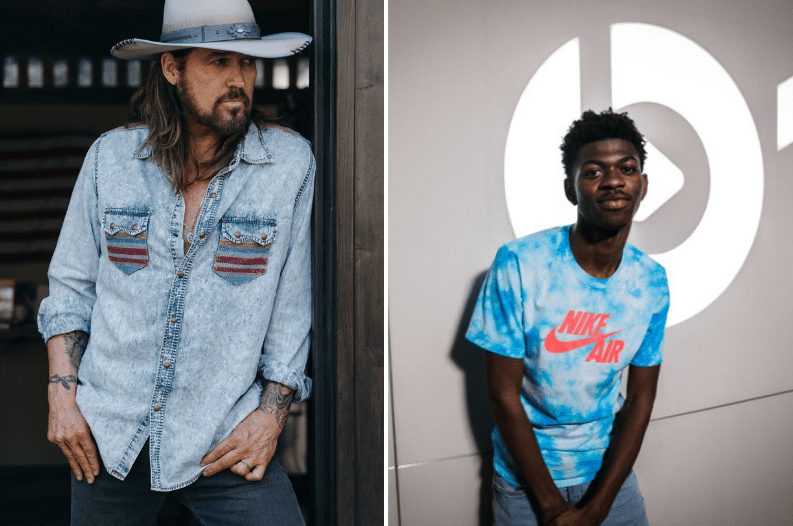 The conversation was still in full swing on Friday (April 5) when Lil Nas X released a remix of the song featuring none other than country star Billy Ray Cyrus. Cyrus kicks off the remix and even gets his own verse on the track. "Got no stress, I've been through all that/ I'm like the Marlboro Man so I kick on back," Cyrus sings. "Wish I could roll on back to that Old Town Road/ I wanna ride till I can't no more"
You can hear the full remix below. In a statement, Cyrus said he embraced the song from the beginning and celebrated Lil Nas X's unique artistry. "I loved the song the first time I heard it. Country music fans decide what they like. Not critics or anyone else," Cyrus said in a statement. "Waylon Jennings once told me every once in a while the industry outlaws someone because they're different. Country music fans don't need to be defined by critics. I've always said, don't think inside the box, don't think outside the box. Think like there is no box. So, I'm honored to collaborate with Lil Nas X on Old Town Road." Cyrus also threw his support behind Lil Nas X on social media. "When I got thrown off the charts, Waylon Jennings said to me 'Take this as a compliment' means you're doing something great!" Cyrus wrote on Twitter. "Only Outlaws are outlawed. Welcome to the club!" Today (April 5), Cyrus shared a behind-the-scenes video of the recording of the "Old Town Road" remix, in which he explains why the song resonated with him.